BEACON FALLS — Justin Marks’ varsity sports career at Woodland has been an injury-riddled one. 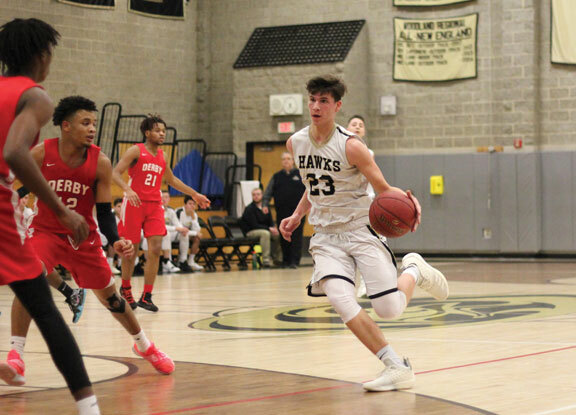 Just last winter as an emerging star for the Hawks’ basketball team, he broke his collarbone taking a charge in a late-season game against Derby. The one-point victory in that game put Woodland in the state tournament, but the Hawks had no shot to make a run in the Division V playoffs without him. In the fall, Marks stood out at the top deep threat for quarterback Tyler Bulinski in the Hawks’ best football season in five years. But while scoring a late touchdown against Ansonia, something happened again. Marks didn’t know what it was, but an injury around his hips rendered him unable to walk back to his own sideline. His season was over. Marks was forced to miss the Hawks’ Thanksgiving eve rivalry game against Seymour and the state quarterfinal loss to Bloomfield. It also forced him to miss the first few weeks on the basketball team, where he’s a co-captain and was set to be the third option in the Hawks’ offense. Checking in at well over 6 feet tall, his return after Christmas was a welcome addition for coach Tom Hunt. Marks scored 22 points in his first two games back, even though he didn’t feel as though he was at his best. He’s been a consistent scorer since, tallying eight points each in recent games against Torrington and Sacred Heart. Marks had 14 points versus Ansonia on Friday and followed that up with nine the next day against Kennedy. Three of Woodland’s four victories have come with Marks back in the lineup. Marks hopes that since now the Hawks are at full strength, they can make a late-season run so he can finally play in a state tournament game.